Roger Antony Deakins, ASC, BSC is an English cinematographer best known for his work on the films of the Coen brothers. 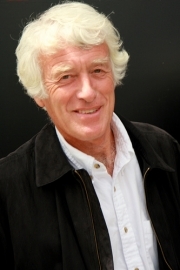 Deakins is a member of both the American and British Society of Cinematographers. He received the 2011 American Society of Cinematographers Lifetime Achievement Award. Deakins was born in Torquay, Devon, England, the son of Josephine (née Messum), an actress, and William Albert Deakins, a builder. He attended Torquay Boys' Grammar School. While growing up in Torquay as a young adolescent, Deakins spent most of his time in and out of school focusing on his primary interest: painting. Several years later, he enrolled in the Bath School of Art and Design where he studied graphic design. While studying in Bath, he discovered his love of still photography. As it turned out, he was a very talented photographer, and this led him be hired to create a photographic documentary of his hometown, Torquay. About a year or so later, Deakins transferred to the National Film and Television School in England. Shortly after graduating, Deakins found work as a cameraman, assisting in the production of documentaries in various locations abroad for approximately seven years. During this seven year stint, his first project involved a nine month trip as one of the entrants of a ‘round-the-world yacht race called, Around the World With Ridgeway. This project captured the lives and growing tensions between several of the yacht's crewmen. Deakins received high praise for his work out at sea showing the parallels between these teammates and shipmates. After completing Around the World With Ridgeway, Deakins was immediately hired by television studios to film several documentaries in Africa. His first, Zimbabwe, was a powerful and informative depiction of the genocide that had been going on there, following Zimbabwe's devastating civil war. His second African documentary, Eritrea – Behind Enemy Lines, was another depiction of conflict, this time within the borders of Sudan, Ethiopia and Djibouti. From the time of his work in Africa until the early 1980s, Deakins continued his cinematographic and directorial work in documentaries as well as the burgeoning field of music videos. His early work as both a director and cinematographer of music videos included Carl Perkins’ Blue Suede Shoes, and the concert film, Van Morrison in Ireland. Subsequently, he worked on Towers of Babel, Sid and Nancy, The Kitchen Toto, and Pascali's Island. Deakins’ first feature film in America as a cinematographer was Mountains of the Moon . He began his collaboration with the Coen brothers in 1991 on the film Barton Fink. Since then, Deakins has been the Coens’ main cinematic collaborator and has been their principal cinematographer. Deakins received his first major award from the American Society of Cinematographers for his outstanding achievement in cinematography for the internationally praised major motion picture, The Shawshank Redemption. The ASC continued to honour Deakins with outstanding achievement nominations for his later works, including Fargo, Kundun, O Brother, Where Art Thou?, and The Man Who Wasn't There, for which he won his second ASC Award. In 2008, Deakins became the first cinematographer in history to receive dual ASC nominations for his works, The Assassination of Jesse James by the Coward Robert Ford and No Country for Old Men. The latter won the BAFTA Award for Best Cinematography and he received Academy Award nominations for both films. In 2009, he was double-nominated for the ASC Award again for Revolutionary Road and The Reader . Deakins also worked as one of the visual consultants for the Pixar animated feature WALL-E and How to Train Your Dragon from DreamWorks Animation. Deakins has received nine nominations for an Academy Award for Best Cinematography. Deakins married script supervisor Isabella James Purefoy Ellis, professionally known as James Ellis, on 11 December 1991. His primary hobby is taking still photographs. Before he entered the National Film School, he spent a year in North Devon, England, documenting the way of life on the farms and in the villages. This cemented his passion for still photography that continues to this day. On the rare days that he is not in his boat while in Devon, he enjoys traveling to various places to augment his growing series of images. Whole or part of the information contained in this card come from the Wikipedia article "Roger Deakins", licensed under CC-BY-SA full list of contributors here.